Gymnopus dryophilus is just about the world's most boring mushroom, if you ask me. 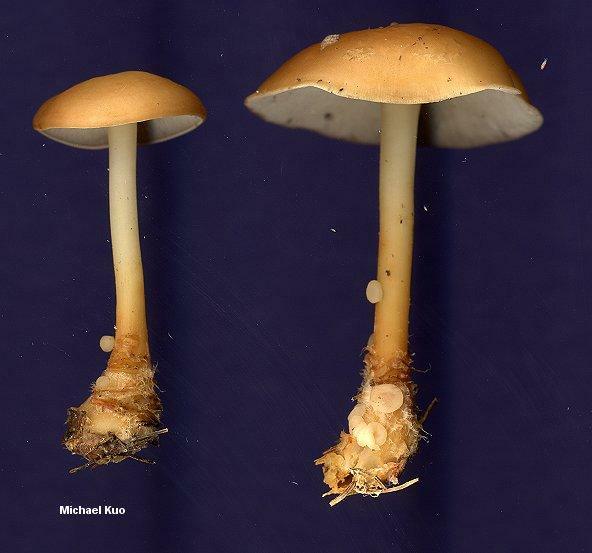 Nothing is worse than tromping through acres and acres of woods with no mushrooms in them, except for a gazillion specimens of Gymnopus dryophilus. So it is a welcome sight--to me, anyway--to find specimens infested with Syzygospora mycetophila. Collybia Jelly parasitizes Gymnopus dryophilus, creating pale, jelly-like growths on the stem, gills, and cap. Apparently Syzygospora mycetophila is not, strictly speaking, the stuff that we see on the mushroom; the jelly-like growths are composed of tissue from the mushroom itself and are induced by the parasite, which uses them for its own ends. If you're about to ask what "its own ends" are, I don't know, but I'm willing to bet that spore dispersal has something to do with it; it's a fungus, after all. 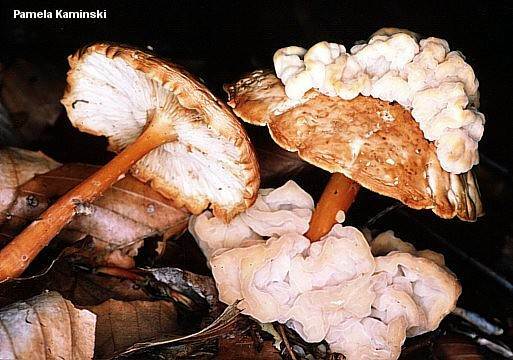 Gymnopus dryophilus used to be known as "Collybia dryophila." 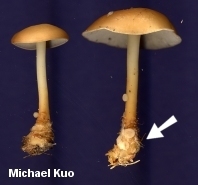 Curiously, a few species of Collybia, including Collybia cirrhata and Collybia tuberosa, are parasites on other mushrooms. Payback is a Collybia-wrecker. Christiansenia mycetophila and Tremella mycetophila are former names. Ecology: Parasitic on Gymnopus dryophilus, which grows in just about any kind of woods, at just about any time, and is widely distributed. Fruiting Body: Gelatinous; waxy; in brain-like or saucer-shaped tumorous clusters; as many as 35 growths on a single mushroom; creamy yellow. Microscopic Features: Spores 6-9 x 1.5-2.3 µ; elliptical to cylindrical. Basidia 4-sterigmate. Clamp connections present. REFERENCES: (Peck, 1874) Ginns & Sunhede, 1986. (Saccardo, 1888; Arora, 1986; Ginns, 1986; Lincoff, 1992; Barron, 1999; Halling, 2003; McNeil, 2006.) Herb. Kuo 06120307.